Emergency braking is the most important control skill needed to avoid a crash. Braking too hard can destabilise a motorcycle, leading to the front or rear wheel locking and causing the bike to overturn or slide, particularly on wet or gravel roads. Alternatively, not braking hard enough can result in failing to avoid a crash. Progressively apply the necessary braking pressure (this is called ‘squeezing the brakes’). Two-stage braking reduces the likelihood of skidding and gives you better control. If the front wheel begins to skid due to incorrect braking, quickly release the front brake and reapply gently. If the rear wheel skids, release the rear brake gently and reapply gently.When releasing the brakes, ease them off gently to maintain the stability of the motorcycle. 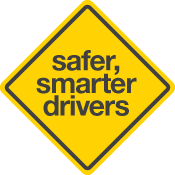 This is particularly important when entering curves.The key to avoiding a crash is anticipation and motorcycle control skills. Anticipation will develop with time and experience. Invest time in practising the correct braking technique. Applying the front brake in a curve can make the motorcycle run wide. 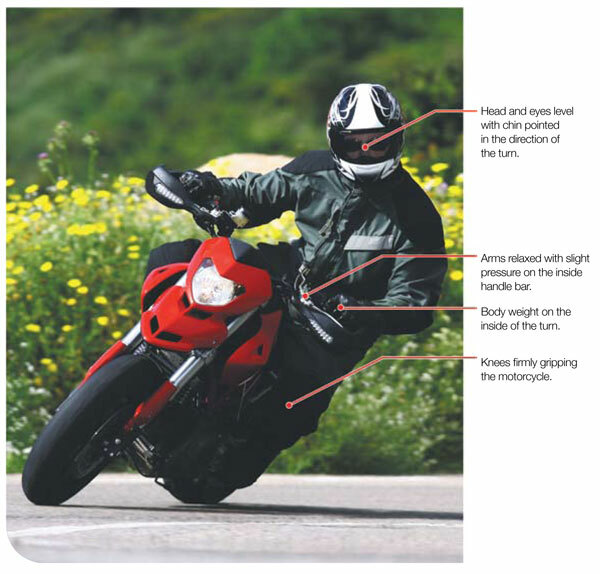 Motorcycles equipped with ABS have important safety benefits and are highly recommended. The ABS prevents a motorcycle’s wheels from locking due to hard braking or slippery conditions, by momentarily reducing the brake pressure applied by the rider and allowing the wheels to continue rotating. Research by the Centre of Automotive Safety Research, University of Adelaide showed that ABS could reduce the overall stopping distance of a motorcycle by up to 17 percent. When you first get a motorcycle take the time to adjust the controls to suit your height and build. Correct riding posture reduces fatigue and improves control. Keep your head up and point your chin in your direction of travel. Relax your arms and place minimal weight on your wrists. Keep your back relaxed and support your weight with your stomach muscles. Grip the motorcycle firmly with your legs and knees. A motorcycle can be steered using a number of different inputs. Handle bar pressure, body weight and changes in speed all have an effect on a motorcycle's direction of travel. Good riders use a combination of these inputs to achieve smooth and precise turns. A motorcycle can be steered by direct steering or counter steering. With direct steering the motorcycle goes in the direction to which the handle bars are turned. With counter steering the motorcycle goes in the opposite direction to which the handle bars are turned, for example a slight forward pressure on the left handle bar will make the motorcycle turn left. Direct steering is only used for very low speed turns, U-turns, turns at intersections, etc. Counter steering has more effect as speed increases. 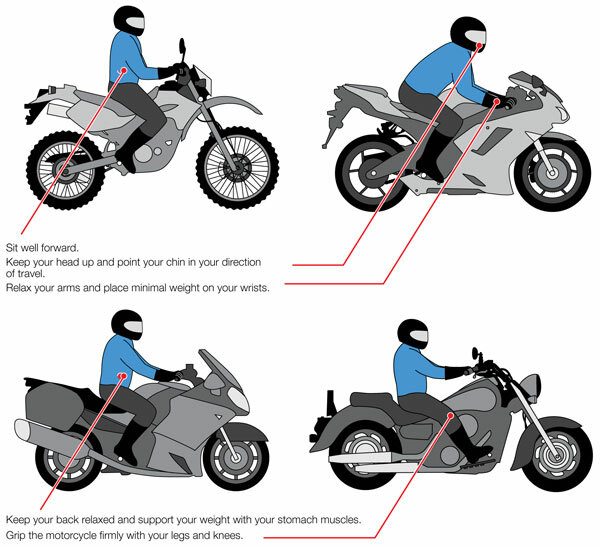 How the rider uses their body weight will have a significant effect on a turning motorcycle. Leaning with the motorcycle in a curve allows the motorcycle to be more upright thereby giving the tyres better grip and the motorcycle greater ground clearance. With low speed turns leaning out from the turn can help balance the motorcycle. The faster a motorcycle is travelling the harder it is to turn. Reducing speed before turning is essential. Wait until the motorcycle begins to straighten before accelerating. Accelerating will stand a motorcycle up and too much will make the motorcycle run wide. During very low speed turns, for example U-turns, a gentle use of the throttle, clutch and rear brake can be used to control speed.